Join Mac, the professional therapy dog, in the Chilliwack campus library for Maui Monday, November 7. 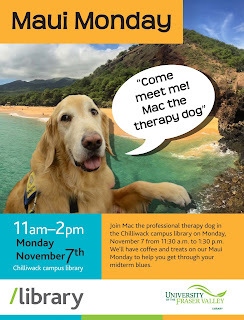 Mac will be in the library from 11:30 a.m. to 1:30 p.m., but our tropical-themed de-stressing event runs from 11 a.m. to 2 p.m. We'll have coffee and treats to help get you through your mid-term blues. Our Find It Discovery Service vendor has an "active service issue" regarding using this product in guest access mode. Some UFV students have been experiencing problems in the past few weeks. We are in the process of switching our search box to the type that routes you directly to the proxy login page before proceeding with a search. This should rectify the problem. If you are still having problems, you can also search directly in a database, such as Academic Search Complete, or use the EBSCOhost Research Databases search box located here. We apologize for the problems this has caused some of our users. Carl Peters Considers What is Creative Writing? 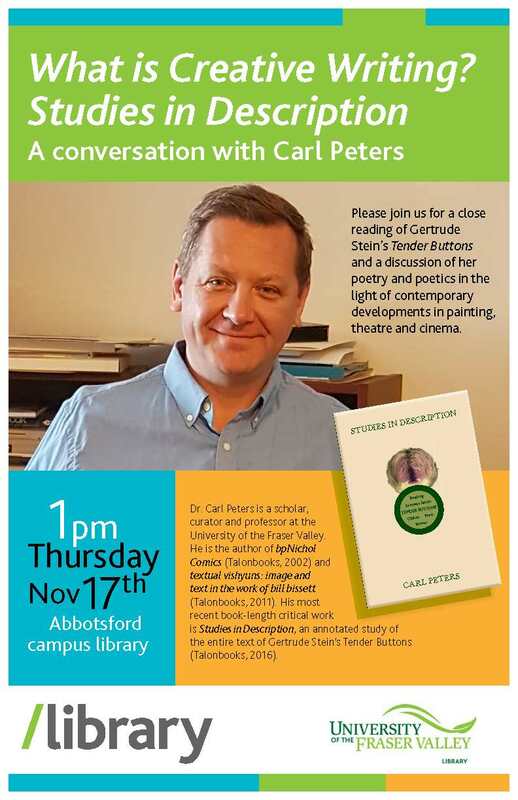 Please join us on Thursday, November 17th in the Abbotsford campus library at 1pm for a lively presentation and discussion on the nature of creative writing. Dr Carl Peters, from the UFV English department, considers this question through a detailed reading of Gertrude Stein's Tender Buttons. He examines Stein's poetry and poetics in light of contemporary developments in painting, theatre and cinema. For more information about Studies in description, please click here. Kimbel, Bobby Ellen. "Gertrude Stein." American Short-Story Writers, 1910-1945: First Series. Ed. Bobby Ellen Kimbel. Detroit: Gale, 1989. Dictionary of Literary Biography Vol. 86. Literature Resource Center. Web. 21 Oct. 2016. The Abbotsford & Chilliwack Libraries are shining purple lights throughout the month of October to remember those who have lost their lives to domestic violence and in support of those who survived domestic violence. 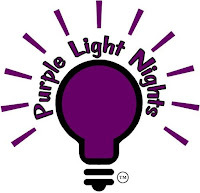 The Chilliwack campus library has purple lights available by donation as well. October is Domestic Violence Awareness Month, and the UFV Library has many informational resources available in print and online. Check out the display in the Chilliwack library or consult our research guide for Social Work to access the collection. 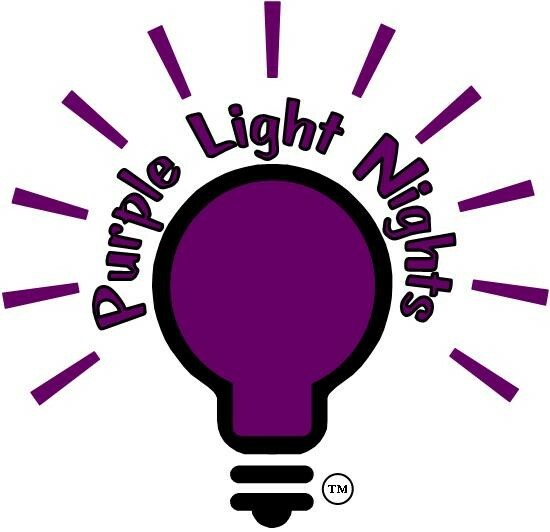 For more information about the Purple Light Nights campaign, please click here. Singer, songwriter, poet Bob Dylan has won the 2016 Nobel prize for literature. His extensive body of work, influence and courage has earned Dylan this astonishing recognition. Click here to read the Nobel press release. Click here to read Dylan's bio-bibliography. There will be an approximately one-hour internet service outage at UFV in the early morning hours of Thurs, Oct 13. The 60-minute outage will occur sometime between 1 am and 5 am. All internet-based services, including, but not limited to, the UFV website, email, myUFV, and myClass, will be unavailable during this service interruption. This is a maintenance outage planned by Telus that impacts a number of sites across the province. This will affect 105 e-books in our collection. They can be identified by their URL, which begins with http://ufvca.ebl.com.